When: 12:00 Noon, Sunday, April 14, 2019 (always at noon the same day as the European Spring Classic, the Paris-Roubaix). Where: Ride from Court Square, downtown Harrisonburg, leaving at 12:00pm Sharp!! What: The Harris-Roubaix is another great, fun cycling event brought to you by your Bicycle Coalition. 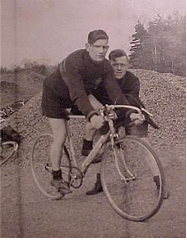 It takes place every Spring on the same day as the Paris-Roubaix. 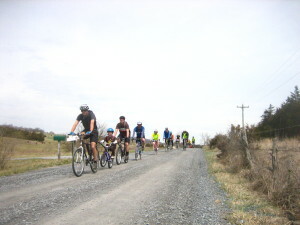 The group leaves from the center of Harrisonburg at noon for a casual ride to a family farm about 7 miles to the north. From the farm there will be a 10-15 mile loop marked for your enjoyment. You are more than welcome to ride the loop once or more, and there is an informal 3-lap race that will crown the Champion of the Harris-Roubaix. What type of bikes will there be? One great thing about Harris-Roubaix is the diversity of bikes. There will be folks on road bikes (durable 25c tires minimum suggested), mountain bikes, tandems, fixed-gears, single speeds, and kids’ trailers. What to bring: Your bike, items to change a flat, water, a smile, and some food to share at the farm–if you bring a dish to share, pot-luck style, to Court Square before the ride, we will bring it out to the farm. The roads of Roubaix A majority of the Roubaix loop will be smooth gravel roads to the Northwest of Harrisonburg, located around the Singers Glen area. This area backs up on the Great North Mountain, so there may be several steep hill climbs. Is this a group ride or a race? It is a group ride to the farm. There, everyone will regroup and receive instructions about the loop and cue sheet if needed. Folks are welcome to ride at any pace. The group will split up during the loop rides, with the race-heads battling it out for the crown while the majority enjoy the beautiful views of the north. Does it cost anything? Not to you. The Shenandoah Valley Bicycle Coalition covers the cost of sag support, snacks, beverages, markings, and cue sheets. But please become a member and JOIN SVBC to show your support for this other local cycling events. Is “court square” where the county courthouse is located in harrisonburg? Tom- Court Square is in the center of downtown Harrisonburg where the county courthouse is located. We hope you can join us! Will there be a 2019 Harris-Roubaix? Oh yes! Same day as that other Roubaix, April 14.